Today saw the first ANA A380 delivery. At a dazzling event in Toulouse, outgoing Airbus CEO, Tom Enders, handed the aircraft over to All Nippon Airlines’ President, Shinya Katanozaka. Following the ceremony, the aircraft took off for Japan at 16:43. Simple Flying attended the event to report on proceedings. This A380 is probably one of the world’s best known, with the exception of HiFly’s aircraft. 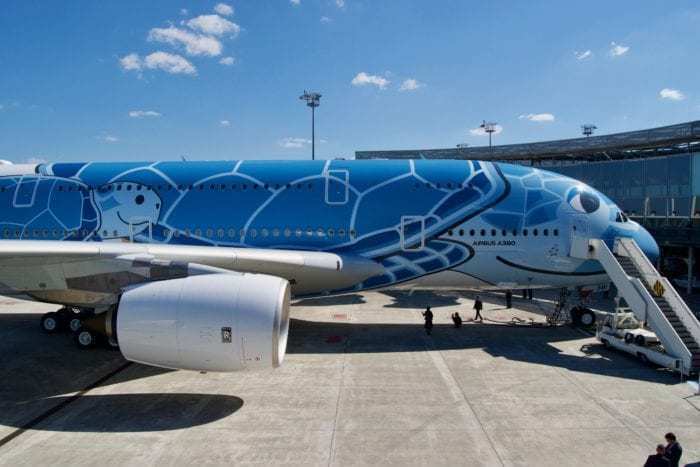 The aircraft is painted in a distinctive sea turtle livery, with the overall colour being ANA Blue. ANA is the first Japanese airline to operate the A380 and will debut the aircraft on the 24th of May, later this year. 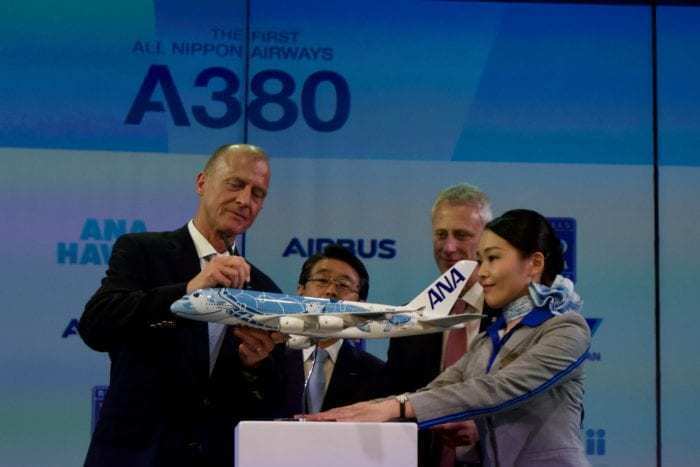 The aircraft was handed over to ANA during a ceremony in which speeches were given by Tom Enders (the outgoing Airbus Chief Executive) Chris Cholerton (Rolls Royce President for Civil Aerospace), and Shinya Katanozaka (ANA President). 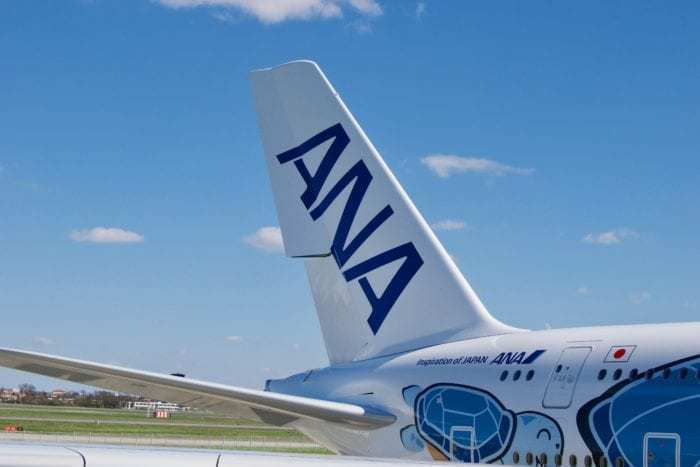 Mr Katanozaka told the event: “We believe the A380 will become a game changer for ANA and will enable us to increase our market share by doubling the number of seats connecting Honolulu and Tokyo by 2020”. 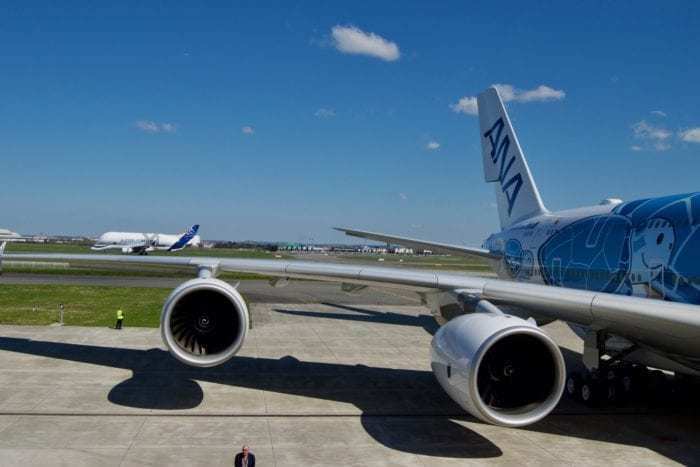 The A380 delivered to ANA today will serve as one of three of the type which the carrier has ordered. The delivery follows the aircraft rolling out of the paint shop in Hamburg in mid-December. The other two aircraft will be delivered later this year and in 2020. The next aircraft is due to leave the Hamburg paint shop on the 25th of May. This aircraft will be painted in an emerald green colour scheme, representing the Hawaiian sea. The green A380 will begin operating for ANA on the 1st of July 2019. Finally, the third A380 in a sunset orange colour scheme will enter service with ANA next year. ANA will be a fairly unique A380 operator in that the three aircraft on order will only ever operate on one route. The aircraft will exclusively operate between Tokyo, Japan, and Honolulu in Hawaii. Hawaii is the number one resort destination for Japanese travellers, and as such ANA has a 90% load factor on the route. The airline currently holds a 15% market share for the route based on the number of available seats. This will increase to 25% when all three A380s are in operation. ANA isn’t just targeting the Japanese market with their Honolulu flights. Currently, most European travellers heading to Hawaii transfer in the contiguous United States. Instead, the company wants European Hawaii passengers to consider travelling via Japan. It takes around 12 hours to fly from Europe to Japan, before an eight-hour flight on to Honolulu. The first commercial A380 flight to be operated by ANA will take place on the 24th of May. The A380 will depart from Tokyo’s Narita airport at 2020 local time before landing in Honolulu at 0840. At 0130, the aircraft will depart en route back to Tokyo, before arriving in Japan at 1500. This will depart from Tokyo on Tuesday, Friday, and Sunday. From the 1st of July, when the second A380 joins the fleet, this flight will become daily. Following its delivery flight from Toulouse, the aircraft is due to land in 9 hours at 1239 local time. The aircraft will be met in Tokyo by another ceremony. What do you think of the aircraft’s livery? Let us know in the comments down below! 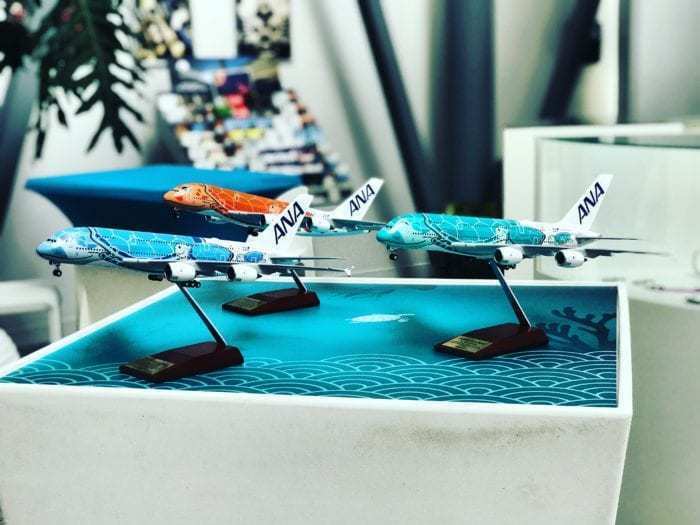 ANA was really celebrating the discount they received for taking these 3 Dinosaurs off airbus’ hands, after all the A380 cancellation announcements in the last 4 weeks…. 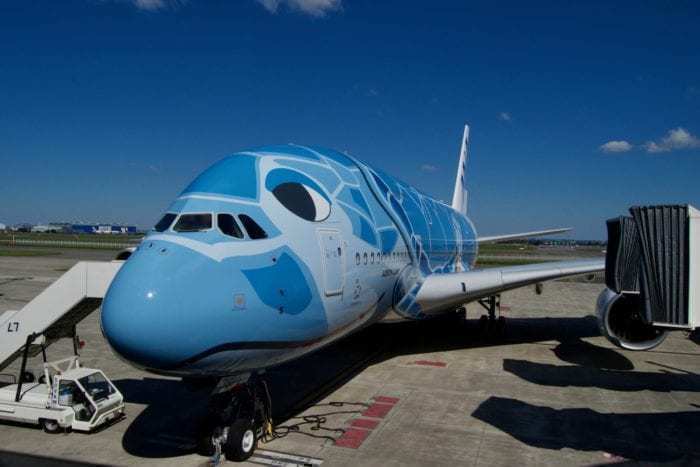 I love the beautifully customized Airbus A 380 Giant Blue Flying Turtle.It is a good idea to promote visiting Japan after Hawai for European visitors.Ana should then make sure when European customers book their flights on ANA to display Hotels and Tours in Japan and to add some glossy brochure about Japan sightseeing in the plane.